“Nadia, Nadia!” cry two girls as they run toward us and pounce with hugs on Nadia Kinani, the principal of the Max Rayne Hand in Hand elementary school in Jerusalem. It seems a bit strange at first, but over the course of our visit we grow accustomed to such scenes, since they keep recurring: Children approach Kinani, sometimes just to give her a hug before moving on, sometimes with a request. Several address her in Hebrew, and she replies in Arabic. “You give a lot of hugs,” we note. “Yes, that’s how I am,” she laughs, not making an issue of it. Kinani, who was first a teacher here, became the school's principal 12 years after it was founded. The Hand in Hand compound includes a kindergarten, an elementary school and a high school, all of them bilingual. The challenges of running a bilingual school only start with the curriculum and textbook choices. When the external world seethes with diplomatic and security crises, outside issues affect pupils and staff – but not always as anticipated. 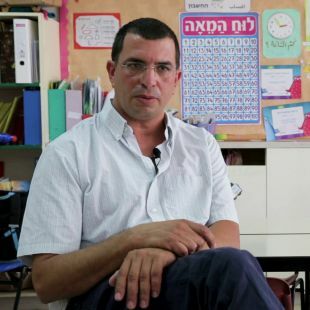 Saporta is a founder and former head of Bakehila, a nonprofit educational group that operates in poorer Jerusalem neighborhoods. “After the 2014 terror attack in a synagogue in Jerusalem’s Har Nof neighborhood, in which six people were murdered, I entered one of the classes and talked about what had happened," he says. "One student refused to use the term terrorist. I felt a tightening in my stomach – what does she mean? He was a terrorist, he murdered people. I asked her why it was hard for her to say the word and she replied that even though he had committed an extremist act that she disagreed with, it was hard for her that only one side is always labeled as terrorists. "This is not an easy exchange for me as well, but it’s important that it takes place. There is a blanket consensus among all students that violence is wrong, but both sides must be understood, which is why the school enables this exchange. We are an incubator but we’re not a bubble. The idea is to introduce these topics in a manner we can work with. We teach civics and political issues from the fourth grade, with the highest number of course hours, with the understanding that this is an instrument for talking about things,” he says. Are students exposed to violence for studying here? Which side does most of the anger toward the school come from? In what language do they learn math? In other words, a Jewish student may have to study math in Arabic and vice versa? What do you do about textbooks? Hebrew books have a lot of content that addresses Jews. How do you handle that in an egalitarian manner? What do you think of the way the school system handles Arab-Jewish issues? Hand in Hand's elementary school is a state school and relies on funds from the Education Ministry, as well as on relatively high supplements paid by parents. Despite the inherent difficulties of running a bilingual program, the school has reached a number of achievements in recent years. 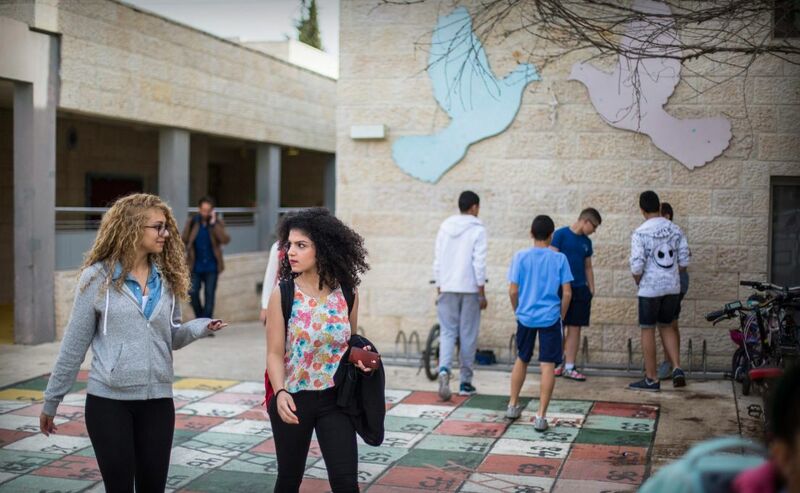 The high school placed among the top schools in Israel in the latest rankings released by the ministry. The percentage of those who received outstanding results on their matriculation exams is four times the national average – almost a third of the students versus the 7.5 percent national average. A relatively high percentage of students pass the matriculation exam (87.5 percent as compared to the national average, 66 percent), and 69 percent of the school's pupils matriculate at the highest level of math (5 units), compared to the national average of 33 percent. In contrast to significant gaps between Jewish and Arab students in the general school system, these gaps are absent at Hand in Hand, says Kinani. These accomplishments are particularly significant in light of the small budget the school is allocated compared to others in Jerusalem. What do you do about the holidays? Are there any school days left after that? What about friendships between the children? Do they cross national borders? So are there mixed couples in high school?